On June 6, 1998 Columcille proudly dedicated the new Infinity Gateway, fashioned in hand-wrought metal by local artist and blacksmith Jim Wyckoff. It stands opposite the massive stone archway of Thor's Gate and suggests to all who enter that these are portals into a world of myth and mystery where the veil is thin between the worlds. To make the passage from one gateway to another is to embark on a journey into another kind of time -- one that moves not from beginning to end, but beginning to beginning. 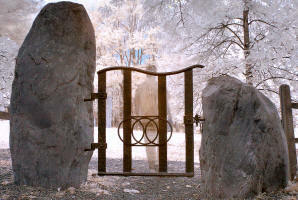 In celebration we open wide the gate, and invite your soul on a pilgrimage of infinite possibilities. "The way you think it is may not be the way it is at all."